Now that cooler weather has arrived and gardening is more of a pleasure, it’s time to look at your landscape and make a few much-needed replacements. In early fall plants go “dormant”, meaning that they don’t need much food or water to survive. You might say that they’re going to sleep. Woody plants and perennials are very forgiving during this period, so you can plant or transplant them without transplant shock. 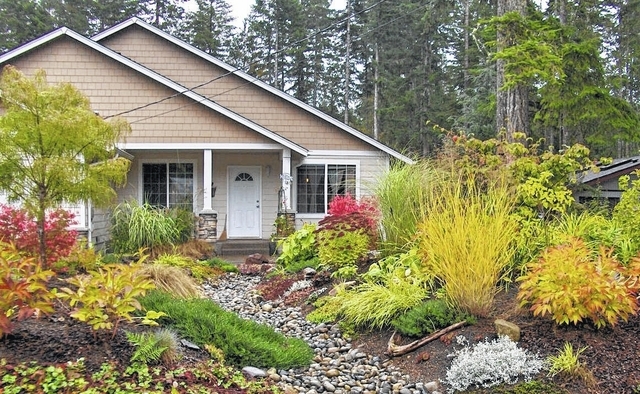 Even container-grown plants adjust better in the landscape after summer stress is over. Dormant plants can be dug and perennials divided with very little stress. Roots are often left behind during transplanting, and this can shock the plant during growth or bloom but doesn’t matter as much when it’s dormant. If roots are damaged a plant can replace them during the fall because it has a lot of stored energy. It has many months to adjust before it must produce new leaves, blooms and fruit. Plants installed in early fall are very vigorous by spring. Fall weather tends to be cool and moist, an ideal climate for newly planted gardens. Landscaping tasks are a pleasure when the weather is cool and breezy, and regular rainfall can help with watering duties. Another plus is that weed competition is minimal in fall. What’s the difference between “planting” and “transplanting”? Planting means taking a plant that’s already above ground and installing it in the ground. Transplanting has two steps: first, digging the plant out of the ground with as many roots as possible, and then planting it in a different location. It’s dangerous to transplant in late spring or summer, because each root has a corresponding stem, so cutting roots can cause transplant shock and possibly kill the plant. Planting can be done any time, because the plant has already adjusted to being above ground and has all the roots it needs to survive. Transplanting is best done when the plant isn’t actively growing. Either way, watering isn’t as critical because dormant plants can survive with a lot less water than plants that are actively growing or blooming. Fall planting actually gives plants more time to get established, so they will perform much better in spring. Another benefit of fall planting is that most nurseries are eager to sell out before winter, so you can find bargain plants that will cost a lot more in spring. Our own nursery has many woody plants and perennials on sale right now. Smart gardeners buy dormant plants and trees at this time of year even though they aren’t always showy. Fall-planting always gives plants a head start compared to planting in spring, and it’s easier on your budget! Steve Boehme and his wife Marjorie own GoodSeed Nursery & Landscape, located near Winchester, Ohio at 9736 Tri-County Highway. More information is available at www.goodseedfarm.com or call (937) 587-7021.